Treat potential supporters as customers - find out what turns them on. Be creative - invent new businesses, services or products to run. Start by seeing yourself as running your own business - it is up to you to develop and market your own services - to create your own niche. Do an anonymous survey to find out how you are perceived. Address identified weaknesses, but major on your strengths. Ask an influential superior to be your mentor. Publicize your achievements - with reasonable discretion. Avoid waiting for specific openings - lobby to create new ones. 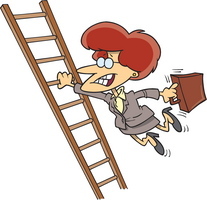 If there is no ladder to climb, build a business underneath yourself. Network widely within and outside the business - broaden your options. If you want a better job, think like a business person, brainstorm with customers to find new ways of offering them what you can do or create whole new services. But selling yourself does not mean boasting. It just means asking the right questions of your customers to better understand their needs. Don't expect them to figure out how to use you. It is your business to think creatively about how you can better support their aims.